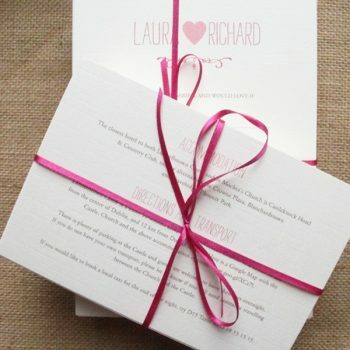 Information cards can be essential to your guests.They allow you to give all the particulars of your big day without cluttering up our invite. 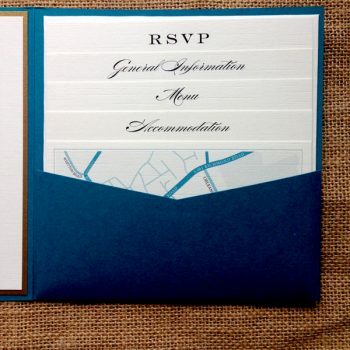 We have designed some beautiful options for information cards which keep them neat an informative whilst adding a unique touch to your invitations. Information cards come in single or double sided – if you are unsure as to what size you’ll need or how many, you can email your wording for them to us and we’ll give you an estimate. Staggered cards are perfect for pockets and wallets since they allow your guests to see all of the titles at a glance. Can include written directions from major motorways, between venue and include maps – either supply your own or use our map drawing service. Including any information about pre booked rooms or preferential rates for wedding guests, as well as nearby hotels, b&b or campsites. Some couples prefer not to invite children to weddings, so a short paragraph to say if children can be accommodated on your big day is important. The above detail is also appropriate for destination weddings although you may want to provide a little information about the local area and flights. Or a map using our map drawing service? Sometimes couples provide a dress code and if your wedding venue has a lot of grass and gravel it is worth letting guests know so the can choose appropriate footwear. If your wedding is set out over a weekend, you may want to give guests a schedule so that the know when to be where and help things run smoothly. The alternative is an illustrated schedule for the big day itself, a modern and fun way to get folks in the right place at the right time, as pictured.